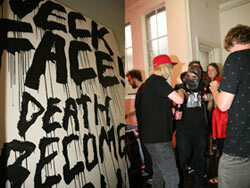 We went down on Halloween night to Neck Face's much-anticipated show Into Darkness!!! which opened at the Oh Wow gallery in Hollywood. Not only was there a halloween haunted house and an Altamont / Baker / Deathwish skate demo, but also Neck Face's new works which included comic paneled pieces, mask and altar type installation works. There were some long long lines of people waiting to get in, but we powered through and good thing too because it was pretty nuts. Also, Altamont Apparelhad some limited run of Neck Face Into Darkness t-shirts too. "After seeing all that art last night the only thing I could think of today was to go see more art! This was the last day to catch the David Choe show at Kantor Gallery, plus we wanted to see Neckface at New Image Art and the new show at JUNC."